SHELL — Three members of Wyoming’s Civil Air Patrol, out searching for a missing Gillette teen, were killed when their plane crashed in the Bighorn National Forest, authorities said Tuesday. The plane went down Monday evening as the crew searched for a teen who disappeared the day before while fishing. On Tuesday, rescuers reached the remote crash site and recovered the bodies of the crew members, said Jeanne Stone-Hunter, spokeswoman for Civil Air Patrol’s Wyoming Wing. The pilot of the Cessna 182R was identified Tuesday night as Lt Col James Henderson, 59 of Cowley. The two passengers were Senior Member James Meyer, 53 of Sheridan; and Capt Patricia Larson, 52 of Sheridan, Stone-Hunter said. “The cause of the crash is not yet known,” she said. “The FAA and the National Transportation Safety Board will be investigating the incident. NTSB and officials from the Civil Air Patrol’s national headquarters at Maxwell Air Force Base in Alabama are traveling to the site Wednesday. Henderson last made radio contact with another pilot in the area at about 4 pm Monday,” Stone-Hunter said. The missing teen, Keith Bellack, 16 of Gillette, was found alive about an hour later. Sheridan Sheriff’s Sgt. Mark Conrad said he didn’t know the exact details of the boy’s condition but that he appeared to be fine. The incident was a typical missing fisherman’s case, and the boy had simply walked farther downstream than his father had expected. “The Civil Air Patrol plane left the Sheridan airport at about 1:30 pm Monday for a two-hour search mission. When it failed to return, the Civil Air Patrol alerted the Air Force Rescue Coordination Center and a search for the plane began,” Stone-Hunter said. The National Oceanic and Atmospheric Agency’s satellite-aided tracking system detected no signals indicating a downed plane, and no air crews reported hearing a beacon. However, a U.S. Forest Service helicopter responding to reports of a wildfire spotted the wreckage at about 7:30 pm Monday. Rescuers had removed the bodies from the plane by about 3:15 pm Tuesday, and Stone-Hunter estimates that they probably arrived at the scene by about noon. She did not know whether it appeared if the plane had flown into a mountain or if there was any other obvious sign of what caused the crash. “The aircraft was destroyed by fire,” said Allen Kenitzer, a spokesman with the Federal Aviation Administration. 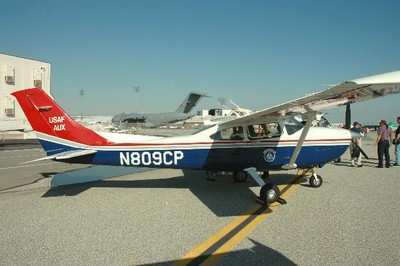 FAA records show the plane was built in 1980 and registered to the Alabama Civil Air Patrol. The plane was based out of Cowley, about 50 miles northwest of Shell, and had received a recent maintenance check, although Stone-Hunter did not know the exact date. The National Transportation Safety Board released its Probable Cause report this week on the downing last year of a Wyoming Civil Air Patrol Cessna 182R. The Probable Cause Report was adopted as of January 31, and states strong winds and low visibility were factors in the 20 Aug 2007 mishap. As ANN reported, pilot James Henderson, 59 and crew members James Meyer, 53 and Patricia Larson, 52 were killed in the crash. They were flying in search of a missing 16-year-old male, who was later found unharmed. Witnesses told investigators they saw the CAP aircraft flying at an estimated 400 to 600 feet off the ground, nearly 2,000 feet lower than what was called for in the prevailing conditions. Weather reports for that day show gusts up to 25 miles per hour. “Mission procedures state that the pilot should adjust the search altitude based upon the winds aloft — 10 knots of wind results in an addition of 1,000 feet to the search altitude and 20 knots of wind results in an addition of 2,000 feet to the search altitude. The pilot reported on his mission planning statement that his search altitude would be 1,000 feet.” reads the NTSB report. Smoke from wildfires contributed to the low visibility, reports the safety board, which combined with the winds likely contributed to the loss of control. Turbulence below 14,000 feet was advised for the entire area, according to a NOTAM included in weather briefings for August 20. The aircraft in the accident received its last inspection in Sept 2006, according to the NTSB, and had 3492.6 hours total air-frame time. Be the first to comment on "Plane Crash in Wyoming Kills 3 CAP Members"